Head Master, English Language Teacher, Kannada Language Teacher, Urdu Language Teacher, Maths Teacher, Science Teacher and Social Science Teacher. 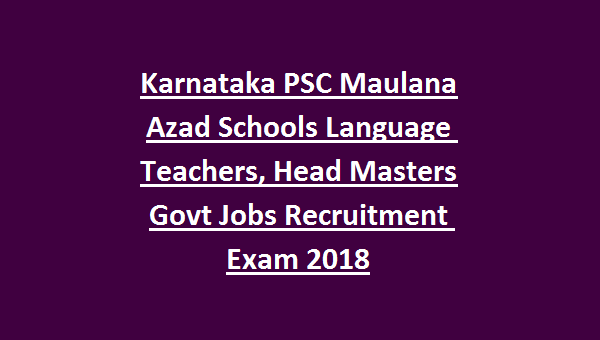 There are total 700 Teachers jobs in this KPSC Maulana Azad Residential Schools recruitment 2018. Official website to apply online is www.kpsc.kar.nic.in. Online applications link will be active Written exam will be conducted for this KPSC Teachers, Head Master Jobs recruitment 2018 exam notification. 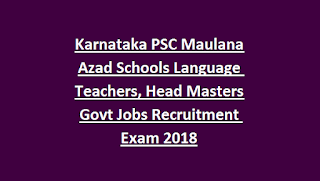 Maulana Azad Residential Schools of Karnataka KPSC Group B and Group C Teachers jobs exam pattern and syllabus, subject wise vacancies, application process and other details are given below. There are total 700 posts are in this KPSC Language Teachers, Head Masters and Subject Teachers jobs. Lower age limits for KPSC teachers jobs is 18 years. Upper age limit is 35 years for General candidates. For Cat 2a/2b/3a/3b upper age limits are 38 years. For Science/Maths/Social Science Teacher Jobs-Degree with B.Ed qualified is required. Written exam will be conducted for this KPSC Group B Posts. Written exam qualified candidates are called for interview. For General Paper-200 Marks-Exam duration is 90 minutes. Written exam (Computer Based written test) consists of two papers. Total exam will be conducted for 200 marks. 0.25 negative mark for each wrong answer. Apply online here for this Karnataka PSC recruitment of Science Teachers, Social Science Teaches, Mathematics, English/Kannada/Urdu Teachers Jobs. Official website to apply online is 22-12-2018. Official website to online is www.kpsc.kar.nic.in.